Early diagnosis of glaucoma can save your vision. At Yaldo Eye Center every case of glaucoma is treated on an individual basis. There are several types of glaucoma, all of which can be diagnosed by the board-certified ophthalmologists at Yaldo Eye Center. – Open-angle glaucoma is the most common form of glaucoma. It develops gradually, destroying peripheral (side) vision first and then central vision. Since there are no early warning symptoms, thorough medical eye examinations that include eye pressure checks are imperative, particularly if you are over 40. – Narrow-angle or angle-closure glaucoma is much less common. A major symptom is the rapid onset of sharp, severe plan around the eye. Blurred vision, halos around lights, nausea or vomiting may also occur. Immediate medical attention is imperative to quickly reduce eye pressure and avoid permanent vision loss. – Secondary glaucoma can result from an eye injury, certain drugs, hemorrhages, tumors or inflammations that block the drainage channels in the eye. Early diagnosis of glaucoma is critical to saving your vision. However, if diagnosed and treated early, glaucoma can be effectively controlled, even though a cure has yet to be discovered. 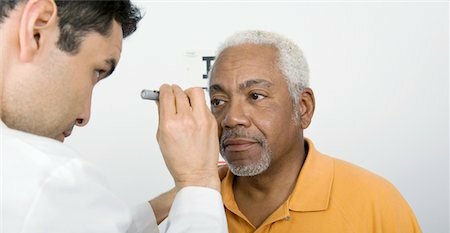 A simple eye pressure test can indicate the presence of glaucoma. Eye drops are frequently prescribed to lower eye pressure. Each case of glaucoma is treated on an individual basis to determine what works best for you and your diagnosis. Each case of glaucoma is treated on an individual basis, and your ophthalmologist at Yaldo Eye Center can discuss every available treatment option with you to determine what works best for you and your diagnosis.